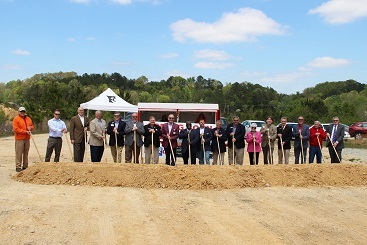 Earlier today, company officials announced plans to construct a new Food City at 540 Highway US-41 in Ringgold/Ft. Oglethorpe. The 49,700+ square foot supermarket is expected to open fall of 2018 and will serve as the area’s second location. “The area residents in both Tennessee and Georgia have certainly been supportive of our company and we’re extremely excited to have the opportunity to provide our loyal customers with a new, state-of-the-art Food City,” says Steven C.
Smith, Food City president and chief executive officer. "For added convenience, Food City is proud to continue its relationship with Tennessee Valley Federal Credit Union (TVFCU), who will offer an in-store branch banking option, Food City Pharmacy offering a full range of services, and a Food City Gas N’ Go, featuring a large five pump station, including diesel fuel. The new location also features several award winning energy saving concepts, ranging from energy efficient glass cooler doors, parking lot lights and refrigeration systems to motion sensors and 100 percent LED lighting, as well as an open rafter ceiling design," officials said. “Our customers will find the same exceptional customer service, top quality products and competitive pricing they have come to expect from Food City, housed in a more energy efficient model, along with some exciting new features and conveniences,” says Mr. Smith. Headquartered in Abingdon, Va., K-VA-T Food Stores (Food City’s parent company) operates 132 retail outlets throughout southeast Kentucky, southwest Virginia, east Tennessee, Chattanooga and north Georgia.